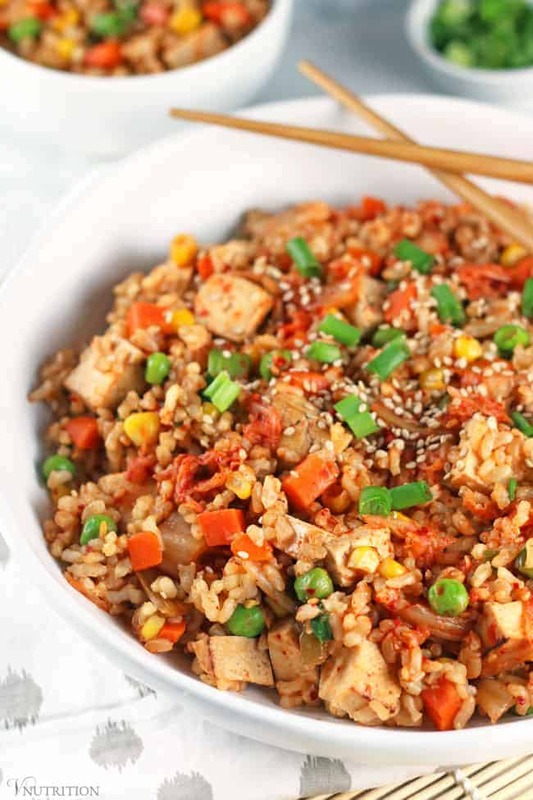 This Vegan Kimchi Fried Rice adds a pop of flavor to a traditional dish. The rice is not actually fried and it uses no oil so it’s a healthy quick meal on busy nights. It’s also vegan, gluten-free, fish-free, and comes together in about 15 minutes. I know you’re probably extremely busy with your job(s), family, friends, school, housework, and/or cooking (just to name a few). That’s why I like to share recipes that are healthy but can be made quickly like my Easy Mushroom Risotto, Lemon One Pot Pasta, Roasted Tomato Chickpea Soup, and Southwest Quinoa. Today I’m sharing another easy, tasty, and lower-calorie dish – my healthy Vegan Kimchi Fried Rice. This kimchi fried rice isn’t actually fried but it reminds me of takeout – only healthier. It’s super quick and easy to prepare especially if you cook the rice the day before and use pre-baked tofu. Have you ever had kimchi? I love it. It’s tangy like raw sauerkraut and it is also a bit spicy and I love anything that gives me a hint of spiciness. I thought it would go great in a vegan kimchi fried rice! My favorite brand of kimchi is Wildbrine and I especially like the Korean flavor. It is made with red chilies, cabbage, mineral-rich sea vegetables, toasted sesame seeds, and a bit of ginger and garlic. The Wildbrine version is vegan, unlike other kimchi that uses fish sauce or dried shrimp. They also don’t use MSG or sugar so it’s 100% natural, vegan, gluten-free, and GMO-free with no additives. If you’ve never tried kimchi before, start with a smaller amount if you’d like. If you love it like I do, add more! Can’t find kimchi near you? You can try making it yourself. Did you know that your stomach/intestinal flora is very important to your health? It’s true! Microorganisms in our GI tract have numerous roles in healthy digestion and disease prevention. They help metabolize toxins, reduce GI inflammation, and help maintain immune homeostasis (to name a few). Kimchi, like other fermented foods, is rich in raw probiotics which can aid in gut wellness. I usually have a bite of kimchi before a meal to fire up my digestion but this time around I put the kimchi right in the dish. One thing to note – kimchi should not be cooked. Once you heat the kimchi, the good probiotics will be killed. This is why I add it in at the end after you finish cooking. When you have leftovers, you won’t get the same benefits because you’ll be heating the kimchi but it still tastes as good! Besides the kimchi, this vegan kimchi fried rice is extra healthy because it’s not actually fried. I don’t use oil in this recipe at all for those that are oil-free. I also use brown rice instead of white rice. Brown rice is a whole grain whereas white is processed and the bran and germ of the rice are removed. 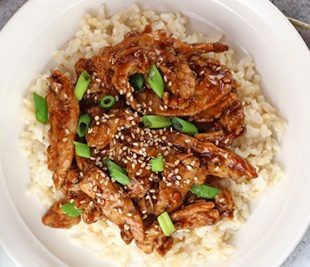 The bran and germ and the most nutritious parts so by eating brown rice, you’re getting more nutrients and less of a blood sugar spike than you would by eating white rice. Finally, I added tofu for extra protein and calcium. Meal Prep Tip: By cooking the rice on the weekend, this meal is ready in no time! 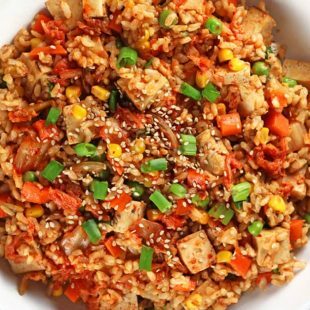 If you make this vegan kimchi fried rice recipe, let me know what you think by ★ star rating it and leaving a comment below. This Kimchi Fried Rice adds a pop of flavor to a traditional dish. The rice is not actually fried so it’s a healthy meal that comes together in about 15 minutes. Add scallions and frozen veggies to a large pan with enough veggie broth to heat them. The amount of broth will vary depending on the size of your pan. You don't want too much, just enough to heat the veggies though and cook the scallions. Add brown rice and soy sauce. Continue adding a little veggie broth when needed. Add in tofu and cook until heated through. Remove pan from heat, wait a few minutes, and then stir in kimchi. Top with toasted sesame seeds and serve! *If you're cooking the tofu yourself, take a package of organic extra firm tofu in water, press out the water (I press for about 15 minutes), cube it into small bite-size pieces. Place tofu in a bowl, add 2 TB soy sauce with a half tsp each of garlic powder and onion powder. Bake it for 15 minutes at 375 degrees F.
Like my Kimchi Fried Rice recipe? It would be so wonderful if you could give it some love by sharing! looks and sounds great! I really need to get into Kimchi – I know very little about it other than it’s fermented and good for you! I haven’t tried to do it myself and haven’t seen many store bought vegan versions where I live. MidWeek Munchies is UP if you want to swing by my place! Thanks so much for all of your help with everything! Jennifer, yes, if you can get some vegan kimchi in your life it’s so good for you! 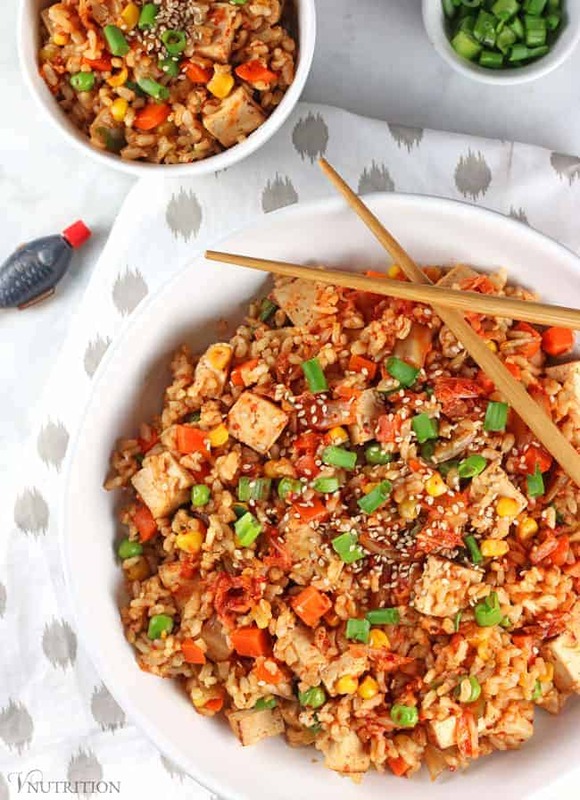 This kimchi fried rice looks delicious! I made kimchi once but I was too afraid to eat much of it, I didn’t trust my fermentation skills haha. I will have to try again some day (or find some in a store!). I am not a huge fan of kimchi, but maybe I should try it again. I like the Wildbrine sauerkraut – I’ll try their kimchi (with this rice dish!). I bet I’ll enjoy kimchi in something instead of just plain on it’s own. Thank you so much Kimmy!!! I’ve never had kimchi…I’ll have to try to find this at my local store! Great recipe. Thanks Renee! Let me know if you try it! I’m obsessed with it lately. Let me know if you try it soon! Never had kimchi but I’ve heard great things. Thanks for linking up with us for Meatless Monday! 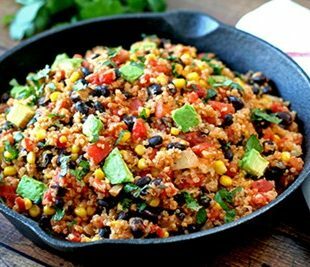 With delectable ingredients like these who can resist this vegan dish. 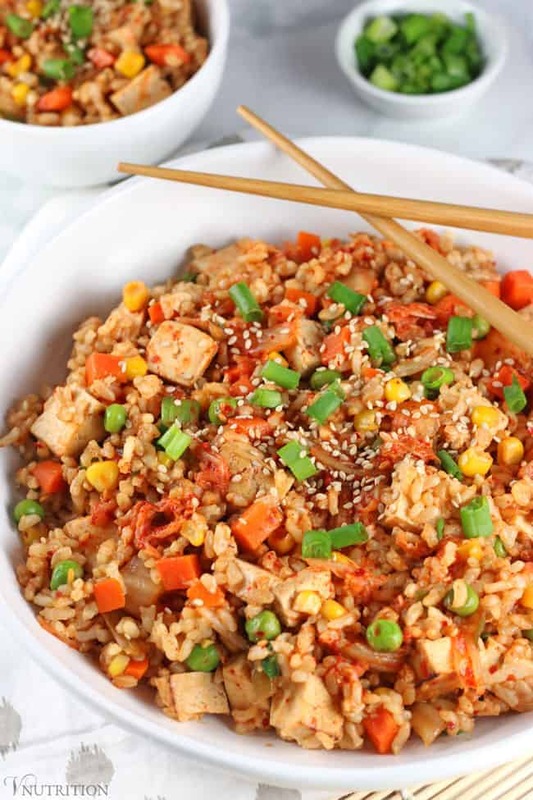 I love kimchi and I love rice so I am delighted that you shared your healthy and delicious kimchi fried rice recipe with us on the Plant-based Potluck Party. I appreciate it and I’m so glad you are partying with us. I’m pinning and sharing this! Thanks Deborah! 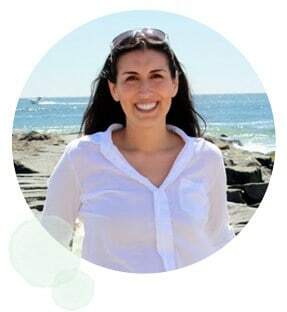 I love sharing at your plant based potluck party! Let me know if you try it Anukampa! I have seen kimchi for sale in the supermarket as noodle meals or as a paste. 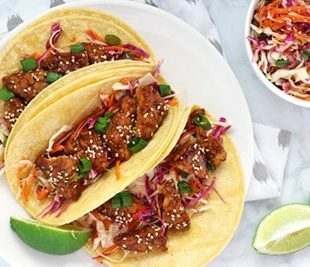 Would the paste be the one to use and if so is it the same amount as in your recipe? If not, I could try making it myself. Do you have a link to a good vegan kimchi recipe please. Hi Sue. I’ve never seen kimchi as a paste before. Any kimchi I’ve seen is just fermented vegetables in a jar so you wouldn’t want to sub in that much of a paste for veggies. I usually find kimchi at a Whole Foods or my local health food store. I went back and linked the Wildbrine kimchi I talked about in my post so you could see what I’m talking about. I have never made kimchi before because I haven’t wanted to ferment veggies on my own yet but I found a vegan kimchi recipe and linked to it in my post above in case anyone else is looking for one too. Let me know if you have any more questions. 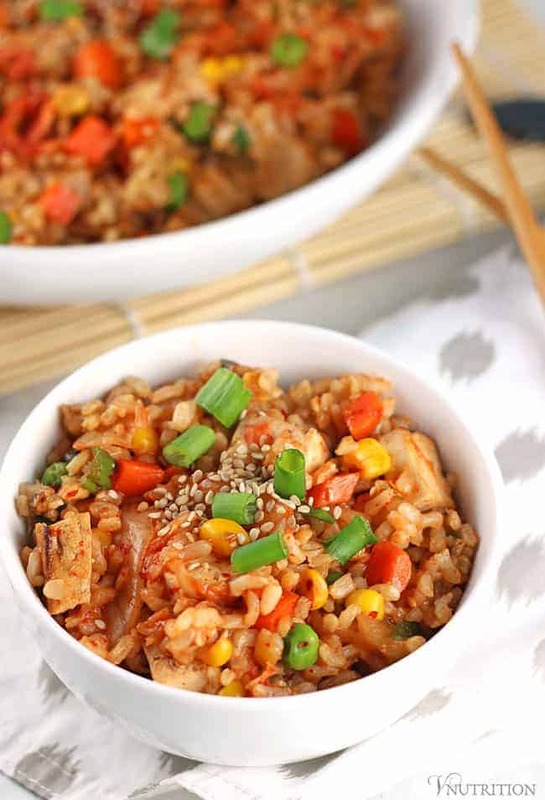 I love the idea of adding kimchi to fried rice!! And beautiful pictures, btw. This looks fantastic! A nice variation on rice dishes I have made before. Thanks for the inspiration. We love kimchi fried rice! Love your healthier version—looks so delicious! Thanks Sarah! Kimchi is amazing!